Be the first to share your favorite memory, photo or story of Jamie . This memorial page is dedicated for family, friends and future generations to celebrate the life of their loved one. 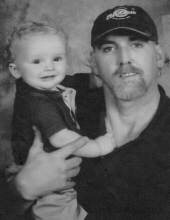 Jamie Darrell Jacobs, age 45, of Hindman, KY, died Thursday, September 27, 2018, at Hazard Appalachian Reg. Med. Ct. in Hazard, KY. He was born in Hindman, KY on October 8, 1972 to Charles Jacobs and Geveda Thacker Jacobs. Funeral services for Jamie Darrell Jacobs will be held at the Hindman Funeral Services Chapel, Monday, October 1, 2018 at 1:00PM with Eugene Thacker, Wesley Thacker, James Hughes, Jamie Hughes, Bill Kirby and Jerry Kirby officiating. Burial will follow at the Thacker Cemetery at Garner, KY. Visitation will be held at the Chapel, Saturday evening after 6PM and anytime Sunday with additional services each evening at 7PM. with Eugene Thacker, James Hughes, Jamie Hughes, Bill Kirby and Jerry Kirby officiating. "Email Address" would like to share the life celebration of Jamie Darrell Jacobs. Click on the "link" to go to share a favorite memory or leave a condolence message for the family.